A newly published travel journal shows how walking, like filmmaking, brings us to the naked core of existence. Early on in Les Blank’s 1980 short documentary film Werner Herzog Eats His Shoe, the star says in his unmistakable Bavarian-inflected English: “I’m quite convinced that cooking is the only alternative to filmmaking.” But almost as quickly as Herzog makes this bold if earnest assertion, he qualifies it: “Maybe there’s also another alternative: That’s walking on foot.” Several years before Blank’s documentary—in which Herzog famously eats his own leather shoe, expertly cooked by himself and chef Alice Waters of Chez Panisse, to make good on a wager with Errol Morris—the German filmmaker had entertained another, equally extreme proposition. In an attempt somehow to forestall what appeared to be the imminent death of Lotte Eisner, the great historian of Weimar cinema and biographer of Fritz Lang and F.W. Murnau, he would walk from Munich to Paris in exactly three weeks in late autumn 1974. By Werner Herzog; Martje Herzog and Alan Greenberg, trans. During the previous years, Eisner had become something of a spiritual mentor to Herzog. Born in Imperial Germany in 1896, she began her career as a critic writing for the Film-Kurier, one of Weimar Germany’s leading film publications. Like many German-Jewish intellectuals of her age, she fled Berlin for Paris in 1933, immediately after the rise of National Socialism. Eisner was sent to a French internment camp, but escaped and survived the remainder of the war under an assumed name. She later became a curator at the Cinémathèque Française, where she collaborated with the institute’s co-founder, Henri Langlois, and wrote her groundbreaking works of film scholarship. Herzog first encountered Eisner in the mid-1960s at the Berlin Film Festival, her first visit to Germany since she’d been forced to flee. There, he heard her deliver a speech that captivated him. 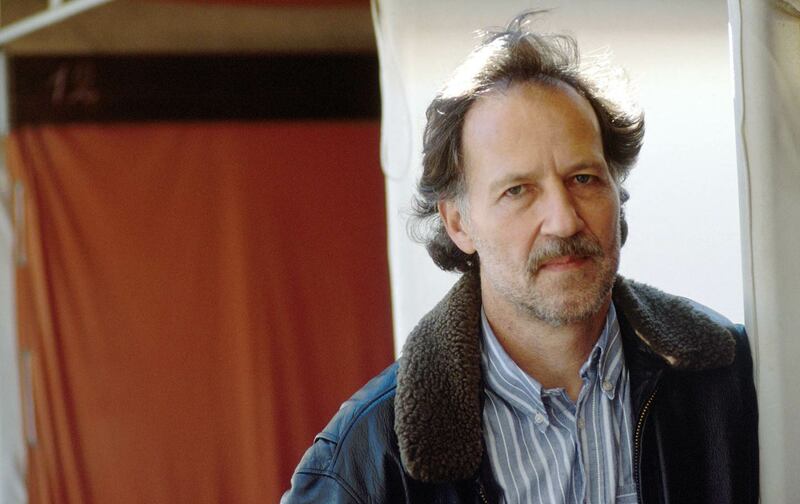 “I walked past the open door of the lecture hall and heard her voice,” Herzog later recounted. “It was so stunning and so special that I just walked in and listened.” Eisner praised Herzog’s debut feature Lebenszeichen (Signs of Life; 1968), even allegedly raved about it to Fritz Lang, but never contacted the director. The two finally met in 1969, after a mutual friend put them in touch. By Herzog’s own account, after his films faced a merciless flurry of criticism in the early ’70s, he acknowledged his increasing disillusionment with his chosen profession to Eisner over tea and cookies in her Paris apartment. “You are not going to quit,” she responded (or so Herzog tells it). “Film history will not allow you.” For Herzog, and for the young German filmmakers of his generation, Eisner’s encouragement offered a degree of legitimacy sorely lacking in the vacuum that was postwar cinema in the Federal Republic. “Just as Charlemagne had to travel to Rome to ask the Pope to anoint him,” Herzog later declared, with characteristic hyperbole, “in the case of New German Cinema we were fortunate to have Lotte Eisner to give us her blessing. She was the missing link, our collective conscience, a fugitive from Nazism, and for many years the single living person in the world who knew everyone in cinema from its first hour on, a veritable woolly mammoth.” Eisner would serve as the voice-over narrator of Herzog’s Fata Morgana (1971) and even visited him on the set of Jeder für sich und Gott gegen alle (The Enigma of Kaspar Hauser; 1974), a film Herzog dedicated to her. One solitary, overriding thought: get away from here. People frighten me. Our Eisner mustn’t die, she will not die, I won’t permit it. She is not dying now because she isn’t dying. Not now, no, she is not allowed to. My steps are firm. And now the earth trembles. When I move, a buffalo moves. When I rest, a mountain reposes. She wouldn’t dare! She mustn’t. She won’t. When I’m in Paris she will be alive. She must not die. Later, perhaps, when we allow it. His maniacal quest recalls, at least in tone and extremity, the legendary battles that Herzog has waged over the course of his career, such as when he squared off with his “best fiend,” the actor Klaus Kinski, in Aguirre, der Zorn Gottes (Aguirre, the Wrath of God; 1972) or Fitzcarraldo (1982)—for which Herzog and crew famously dragged a riverboat over a Peruvian mountaintop. Here, too, the director faces the larger, more pressing question of mortality—applicable not just to Eisner, but to humanity at large. “The teenagers on their mopeds,” Herzog writes just a few pages in, “are moving toward death in synchronized motion.” He senses an infestation of rabies while walking through the countryside and observes more generally a strange, haunting quality to the landscape: “A cornfield in winter, unharvested, ashen, bristling, and yet there is no wind. It is a field called Death.” Still later, he writes: “The villages feign death as I approach.” And finally, as if describing a medieval scene during a plague outbreak: “A black morning, gloomy and cold, a morning that spreads itself over the fields like a pestilence, as only after a Great Calamity.” Perhaps we shouldn’t lose sight of the fact that Herzog was working on Nosferatu, his rendition of the classic vampire film, at the same time he was preparing the final text of his diary. The recurrent references to disease, madness, even a menacing flock of buzzards that follows him from Munich, may merely be spillover, a shared palette, from that other project. Much of the diary concerns the increasing isolation that Herzog felt inching his way toward the French capital. “A loneliness like this has never come over me before,” he writes on the fifth day. Not far outside Paris, he remarks: “It is the loneliest day, the most isolated of all.” The waves of acute solitude hadn’t subsided by the next day: “The loneliness today stretched out ahead of me toward the west, though I couldn’t see that far as my eyesight let me down…. The road was so endless, I was overwhelmed by fright.” Occasionally, his mind drifts to professional preoccupations no less depressing—as, for instance, the time he and German avant-garde filmmaker Harun Farocki experimented with making napalm—or to politics, as when he ponders the alleged execution of Haile Selassie (“His corpse was burned together with an executed greyhound, an executed pig, and an executed chicken”). Finally he indulges in such reminiscences, like the time he pushed his grandmother up a mountain in her wheelchair at a family wedding. I went to Madame Eisner, she was still tired and marked by her illness. Someone must have told her on the phone that I had come on foot, I didn’t mention it. I was embarrassed and placed my smarting legs up on a second armchair, which she pushed over to me. In the embarrassment a thought passed through my head, and, since the situation was strange anyway, I told it to her. Together, I said, we shall boil fire and stop fish. Then she looked at me and smiled very deli­cately, and since she knew that I was alone on foot and therefore unprotected, she understood me. For one splendid, fleeting moment something mellow flowed through my deadly tired body. I said to her, open the window, from these last days onward I can fly. It’s impossible to read Of Walking in Ice without hearing Herzog’s voice, the same voice that in Grizzly Man (2005) narrates Timothy Treadwell’s intoxicating journey into the grizzly-populated forests of Alaska, or that in Cave of Forgotten Dreams (2010) guides us through the darkest depths of the Chauvet Cave in southern France, searching for some of the earliest traces of human expression. The slightly wooden translation, prepared by Herzog’s first wife Martje, together with Alan Greenberg, complements the rhythms of Herzog’s spoken English: “One pheasant behaved like a madman: it danced, spun about, uttered strange sounds, but no mate would it woo.” Those readers familiar with Herzog’s films—presumably, the target audience for this book—will have no trouble recognizing various recurrent motifs of his, even stray figures from his fictional and documentary work. “Walking on foot brings you down to the very stark, naked core of existence,” Herzog told a Film Comment interviewer in 1979, a year after Of Walking in Ice was first published in Germany. “We travel too much in airplanes and cars. It’s an existential quality that we are losing. It’s almost like a credo of religion that we should walk.” Over the course of many years, and in countless different interviews, Herzog has spoken of his filmmaking—and of walking—in vaguely spiritual, even divine terms (“It’s like a grace, like a gift of God that has fallen into my lap”). His trek to Paris is no exception, and may in fact be seen as a more extreme version of his various attempts at cinematic salvation. As Eric Ames notes in his superb study Ferocious Reality: Documentary According to Werner Herzog, “The religious analogy, the imitation of Christ by means of pilgrimage, cannot be missed: Herzog himself would endure physical suffering so that Eisner might live.” Eisner lived another nine years after his fateful journey, though it may only be Herzog who senses a causal connection.